This book provides candidates with an excellent opportunity to familiarise themselves with the content and format of the exam and to practise exam techniques. The book contains practice material for Paper 1 and Paper 2, with attractive colour visual material for Paper 3. The audio CD, which is available separately and also as part of the Self-Study Pack (book and audio CD set), contains the recordings for Paper 2. 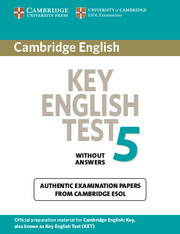 Cambridge University Press is the only official publisher of past papers from Cambridge ESOL. Book numbers indicate how many are available in the series - numbers do not refer to levels.